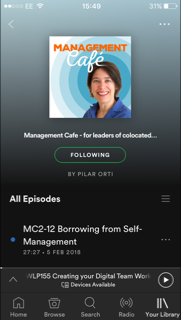 Just Maya and Pilar’s voices in today’s episode, and a single ‘voice behind the book’ segment - because this marks the official launch of Thinking Remote: Inspiration for Leaders of Distributed Teams. · How are we doing? And, at the end of each of the 13 chapters there are some leadership reflections designed to get you thinking about the material and relating it to your own experiences and situation. So the book role-models the Virtual Not Distant coaching approach, and actually, it also role models the coaching mindset, which is so essential when running a remote team. This mindset is also reflected in the accompanying email series and follow-up course for the book, which is designed to help all readers get the material off the page and into their teams and organisations where they can make a difference. We look forward to your feedback and reviews, because everything we create is inspired by our community here, our podcast listeners and blog readers and social interactors. Everything worthwhile is a collaboration – and we worked with a great editor, Lisa, through Reedsy.com, Manuel did our cover, and Simon designed the interior of our print version, the e- versions have been done by myself on Vellum. Thanks also to Marija for being involved at a distance and thanks to Ross for putting this episode together, as always... To bring this book to you our readers, in as many formats and stores as we can. If you are having trouble getting hold of it or if you have any thoughts and feedback, please let us know!